[2:19] <Datalink> I wonder, would the Pi be able to handle a NAND Flash device like the Odroid's eMMC chips? [4:03] <pksato> if not need GPU (play videos), yes. [4:06] <ports> im thinking of ditching my VPS provider and using a RPI to run ZNC/irssi/tmux from home..
[4:07] <ports> shiftplusone: not yet! [4:09] <ports> is there a linux client for dropbox? [4:11] <halabund> shiftplusone: sorry for the delay, there’s a bird here that keeps distracting me … so does that include setup too, or only usage after setup? [4:20] <ports> shiftplusone: theres a kit on amazon $50 for a model B, clear case, and wifi adapter..
[4:22] <[Saint]> The main probalem I see is people wondering why their picoUSB wifi adapter they got for $5 has a range of 12"
[4:22] <[Saint]> WHy? "You gots no antenna, yo". [4:23] <shiftplusone> I've gone through quite a few wifi adapters. The good ones require a powered hub, the 'meh' ones that work and which many people recommend work, but I am far away from the router, so I get all kinds of problems. I found it's best to just leave it next to the router. That's my experience anyway. [4:23] <[Saint]> ^ yeah, that. [4:24] <[Saint]> You really need to have the magic combination of kernel, distro, and driver to get a "It Just Works" situation. [4:24] <[Saint]> And those are few and far between. [4:25] <[Saint]> Those cause some confusin, because there's three different variants that all need to be treated slightly differently. [4:27] <sney> so it's like "welcome to linux, new user, now compile an out of tree driver"
[4:27] <[Saint]> that one "just works" in the new kernel. [4:27] <shiftplusone> I've compiled it a few times myself, since a few folks couldn't figure out how to. [4:28] <[Saint]> It was very refreshing. [4:28] <sney> [Saint]: well yeah, out-of-tree modules usually get merged in posthaste as long as they're not full of binary blobs or horribly broken, but that's not fun for people stuck on 3.10 for whatever reason. [4:28] <sney> what's rpi-update (ugh) pushing these days? still 3.6.11+? [4:29] <[Saint]> I steer clear of that /boot partition destroying mess. [4:31] <ports> shiftplusone: does the rpi have hdmi out? [4:32] <[Saint]> It would be correct. [4:34] <ports> newark isnt the official? [4:35] <[Saint]> any swear bot is bound to end in hilarious matching fails. [4:36] <shiftplusone> sney, you're not flagged anywhere in any way here. [4:43] <ports> are there any must get accessories for the rpi besides a case? [4:43] <[Saint]> I wouldn;t even necessarily say the case is "must get". [4:44] <m1nus> why would i not be able to use modprobe to view the temp sensor? [4:45] <[Saint]> I usually just use the hialrious little pink case it ships with. [4:46] <[Saint]> I can't say what condition you'll get it in if its not an official reseller, though. [4:46] <[Saint]> With a good enough spot, sure. [4:47] <[Saint]> I went out the other day and captured a bunch of traffic by overpowering a very weak free wifi AP. [4:47] <[Saint]> I mean...errr...no I didn't. [4:50] <ports> sney: hows that keep you from seeing my real ip? [4:51] <[Saint]> Why do that when you can hostmask and use SASL? [4:52] <[Saint]> "Hey, freenode guys - give me a hostmask"; "Ok, sure. Here, done". [4:53] <[Saint]> with anything that doesn't support SASL, just make sure you don't connect to any channels before you're authenticated. [4:53] <[Saint]> Then your real IP should never be exposed. [4:53] <sney> yeah. and if you use a bouncer that keeps you identified then that's taken care of transparently. [4:54] <[Saint]> The mistake I see people making is autoconnecting before authentication, then services "disconnect" and reconnect you. [4:55] <[Saint]> You don;t see it, but everyone else sees your IP join, immediately leave, and then the hostmask join. [4:55] <[Saint]> A bit of a fail unless you know about it. [4:55] <[Saint]> SASL fixes this by making sure that the very first thing that happens is authentication. [7:41] <AlterDim> Hello all, I'm trying to install node on a fresh raspbian install. I'd followed the usual method of install node(by wget-ing the binaries and sym linking), node seems to work fine, npm however throws Illegal Instruction. Any thoughts on this could be helpful. Thanks! [7:57] <mrmoney2012> ignore me - working - if in doubt... turn it off and on. [8:21] <[Saint]> "Have you tried turning it off and on again?" [8:21] <[Saint]> I just spent half an hour looking in extremely unlikely places for reasons why I had no ethernet activity. [8:22] <[Saint]> When two simple checks could've pointed me in the right direction. [8:22] <[Saint]> Is ethernet working elsewhere? [8:22] <[Saint]> Have you tried turning it off? [8:23] <[Saint]> I did. But I made a very crude decision. [8:23] <[Saint]> I checked my phone's wifi, and decided it couldn;t be the router at fault. [8:23] <Psil0Cybin> oh i hate routers. [8:23] <[Saint]> This router/switch combo hasn;t given me any grief before, except for once, and that was my fault. [8:23] <[Saint]> I had all but forgotten the joys of routers. [8:29] <AlterDim> Do you guys know the version of node that works on the RPi? I keep getting the "Illegal Instruction" error no matter which version I try to install. [9:24] * [Saint_] pretends saying that in this channel was intentional. [9:59] <shiftplusone> Would you like to set the working directory within python or elsewhere? [10:00] <Raynerd> All my files are in AirPi/. So I just want to set that as the working directly. [10:02] <Raynerd> Ahhh double && !! [10:02] <Raynerd> I also noticed during googling that some people put an & right at the end of the line. Any idea why? [10:04] <[Saint]> thats as simple as I could describe it I think. [10:05] <[Saint]> Bit thats probably got some pitfall where it falls through. [10:05] <shiftplusone> shell waits for each command to terminate in turn. The return status is the exit status of the last command executed. [10:05] <Raynerd> Ahhh it keeps booting it up!! [10:06] <shiftplusone> it's stupid in cron though, don't do it. [10:10] <shiftplusone> Raynerd, you'd solve a lot of problems for yourself if you got to know linux a little better. [10:11] <shiftplusone> What do you mean exactly there? as in /usr/bin/python airpy.py or python /path/to/airpy.py ? [10:11] <Jusii> Raynerd: were you running this script one a minute? [10:11] <shiftplusone> different script Jusii he has moved on to bigger and better things. [10:12] <[Saint]> problem is. being given the answer solves little. [10:12] <shiftplusone> Raynerd, yes sir (I know you're not an idiot, that's not what I am implying). [10:13] <shiftplusone> Being given the answer AFTER you've tried to figure it out yourself is not really a problem in my book. [10:13] <[Saint]> youll usually find what you want has been answered on stackexchange a bajillion times. [10:14] <Raynerd> If you let people struggle long enough they give up. [10:14] <[Saint]> Depends how bad they want it. [10:14] <Raynerd> I guess irc is pointless then? [10:14] <shiftplusone> Raynerd, are you familiar with the hashbang/shebang yet? [10:15] <[Saint]> I think what shiftplusone was trying to say earlier is, "maybe try to walk. before you run". [10:15] <[Saint]> Its boring. But it really helps. [10:16] <Raynerd> Ahh that is cool!! [10:17] <shiftplusone> As a side note, gg on that coin pusher. Are you done with it or still planning to add stuff? [10:17] <[Saint]> a python, you mean. [10:17] <Raynerd> Haha, no, in my kids bedroom all done. [10:18] <shiftplusone> with your own mechanism and everything? [10:20] <Raynerd> Ha, it needs polishing! [10:21] <[Saint]> I dont have the space for it. [10:21] <[Saint]> *after* moving to a place twice the size of my last place. [10:24] <[Saint]> I envy you guys that make...stuff...out of other stuff. [10:24] <[Saint]> Power tools aren't my friends. [10:25] <Raynerd> [Saint]: I teach at school and a big reason for trying to learn is to help kids that are interested! [10:25] <Raynerd> That said, I am getting pretty engrossed and excited by it. [10:26] <[Saint]> what age group? [10:28] <[Saint]> Ah. I used to run an after school programme and holiday programmes for the City Council here. [10:28] <Raynerd> Hahah!!! Ok... It is working!!! Terminal doesn't actually come up and show does it using crontab??!! It is running in the background and I didn't know ! [10:28] <[Saint]> But much younger. [10:28] <[Saint]> 5 to 8 and 8 to 11. [10:29] <[Saint]> Yeah. Kids will stuff themselves with any knowledge you point at them at that age. [10:29] <shiftplusone> Raynerd, yes, cron is used to automate things that run in the background. You can't (or rather shouldn't) use it for interactive stuff. [10:30] <[Saint]> IFF you get their attention. [10:30] <[Saint]> Which gets harder as they age. [11:14] <lianj> is there any way for rpi to support 2048x1536 res? [11:16] <lianj> 77 is 2560x1600 60Hz, so it should at least be able to output that many pixels, no? [11:27] <a7x> what is that? €€? [11:29] <steve_rox> so you got any interesting plans/projects for a rpi? 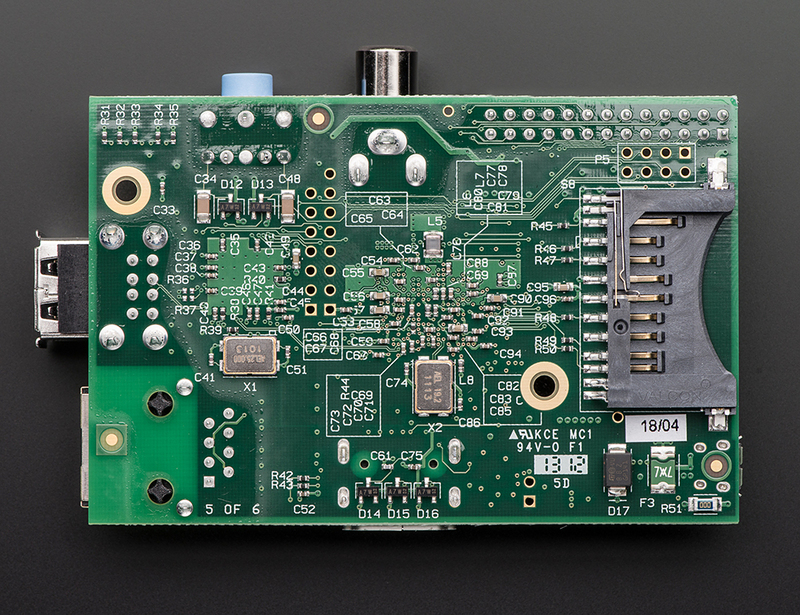 [12:19] <xorox90__> Is it possible to use raspberry pi as logic probe? [12:25] <[Saint]> That would beba bit of overkill, no? [12:25] <[Saint]> Basic logic probes are pretty cheap these days. [12:25] <shiftplusone> Depending on the required frequency, I don't see why not. [12:25] <[Saint]> And well buikt. [13:17] <SpeedEvil> The pi is not a very good logic probe - it's too slow for many tasks, with fragile inputs. [14:18] <dagle> So, my card + pi sometimes boot and sometimes it doesn't and when it doesn't I need to reflash etc. When I mount the sdcard in my pc everything seem fine. Some linux versions works better than others but none is really stable. I have tried multiple cards and some are more likely to not boot than others and I'm getting pretty pissed at this. [14:19] <dagle> And the wiki game me almost nothing. [14:20] <shiftplusone> when it doesn't boot, what happens to the ACT LED when you plug in the power? [14:21] <dagle> Only the red light turn on. [14:21] <dagle> No, flash, no nothing. [14:22] <dagle> How would somebody resolve the issue with it being to thin? I have tried gently pushing the card upwards to no effect. [14:25] <dagle> I think you might be correct. I tried to push it further up and now it seem to work. [14:25] <dagle> shiftplusone: Thank you. [14:26] <shiftplusone> dagle, do you have print labels? [14:27] <shiftplusone> you can stick on a layer or two to make the card thicker. [14:29] <dagle> I will try that . [14:45] <shiftplusone> Datalink, does it make any difference? [14:45] <shiftplusone> does the pi care to check? [14:46] <shiftplusone> Hmm, will need to do some testing next time. [14:49] <shiftplusone> I don't doubt you, it's just one of those things I'd like to verify before fully accepting. [14:58] <shiftplusone> adafruit has... a lot of pictures. Which are you talking about? [15:03] <Datalink> may I show that pic to friends of mine over in #sparkfun? [15:06] <shiftplusone> I made the wrong choice to use a bad sidecutters to remove the old connector and that ended up lifting the pad. So then I went with a heat gun instead for the rest of it, which required hell of a lot of heat to melt the solder and keep it molten to remove slot. [15:06] <shiftplusone> so the whole thing is a botched job, but it works, so I am happy enough. [15:12] <shiftplusone> But yeah, having taken a proper look at the photos and pinout, my mistake. [15:13] <dagle> Datalink: They touch. [15:13] <dagle> Atleast when I remove the case they seem to touch. [15:14] <dagle> Hard to tell with the case on, since it hides most of it. [15:14] <Datalink> yeah, does the case bolt to the Pi in any way, or just snap together around it? [15:15] <Datalink> okay, is the behavior consistantly happening when the case is on, or has it been intermittent? [15:16] <shiftplusone> with the case off, next time it happens, see if pinching the card to the board makes a difference. [15:19] <dagle> I belive more in the "to thin" thing though, since the filesystem have set itself in ro and not readable from time to time... about 1 hour after booting. [15:22] <[Saint]> 'aint nobody got time fo that. [15:48] <Raynerd> When using a shebang line, should you strip the file of any extension or not? [15:49] <gordonDrogon> note that filename extensions don't actually have any meaning in linux - it's just a human convention. [15:51] <Raynerd> So actually .py at the end does absolutely nothing at all? [15:51] <gordonDrogon> yup. nothing at all. some interpreters may insist on it though, but it's really for your own convenience. [15:52] <gordonDrogon> e.g. my BASIC interpreter saves files with .fuze or .rtb on the end, but it'll run files without that. [15:52] <ShorTie> Raynerd, i know this is like off the subject, but when you run your airpi.py from the command line does it display any usefull info ?? [15:52] <gordonDrogon> and I typically put .sh on shell scripts, but again, that's for my convenience not the systems. [15:54] <Raynerd> Could you give me more details on that or what to read?? [15:57] <Raynerd> Hummm.. I am sorry. I don't really understand. The truth is, I have it working perfectly! 1. Boot up pi. 2. Cd AirPi. 3. Sudo python airpi.py. Done!!! [15:57] <Raynerd> When I try and automate this, things start to go wrong. [15:58] <gordonDrogon> what is airpi? [15:58] <gordonDrogon> why not just put in in /etc/rc.local ? [15:58] <gordonDrogon> it wil lbe run as root..
[15:59] <gordonDrogon> yes, really. no need to bother with a crontab. [15:59] <gordonDrogon> you do need the full path to it though. [16:00] <Raynerd> One second, let me try this. [16:02] <Raynerd> gordonDrogon: Do i need to tell it to run as python script?? [16:02] <gordonDrogon> rc.local is run as root already. [16:04] <gordonDrogon> if you can ./airpi.py then it's fine. [16:04] <gordonDrogon> and that's then the easiest way to run it. [16:06] <gordonDrogon> ShorTie, learn the mnemonics :) octal numbers are so 80's. [16:06] * gordonDrogon ponders ... 70's. [16:11] <Raynerd> gordonDrogon: Maplin - you uk? [16:11] <gordonDrogon> Raynerd, ok - but be aware that that will appear to "lock up" the Pi. [16:12] <Raynerd> gordonDrogon: Lock up in what way? [16:12] <gordonDrogon> Raynerd, stick and & at the end of the command to make the system boot normally & let you login. [16:12] <gordonDrogon> it will run your prog. then wait for it to finish - & makes it run in the background. [16:13] <gordonDrogon> it really doesn't matter. spaces are for humans convenience. [16:13] <gordonDrogon> most of the time. [16:16] <ShorTie> not sure if it works but sumfin like this for screen from what i looked at real quick /bin/su pi -c "/usr/bin/screen -dmS test bash -c '/home/pi/airpi.py exec python'"
[16:16] <gordonDrogon> ps ax | fgrep airpi <- to get the process ID. [16:17] <Raynerd> Ok... It is all running, including the picture mode. Just need to see if it updates. [16:19] <gordonDrogon> or re-direct all output into a file and use tail -f on that file. [16:20] <gordonDrogon> using screen is a technically superior method, but sometimes it's just overkill and complicates everything. [16:20] <gordonDrogon> the output will be going to the console - so if you have a screen connected you'll see it. [16:21] <gordonDrogon> if it produces MB of output it'll eventually fill up /tmp though. [16:22] <gordonDrogon> Hm. maybe python detects it's running without a terminal and suppresses output? [16:23] <gordonDrogon> make your program open a file and log into it - if this is a system utility then that's arguably the correct thing to do, but adds more complications. You could also use the syslog facilities. [16:24] <ShorTie> but that will fill up your sdcard over time, won't it ?? [16:24] <gordonDrogon> depends how much it logs - do an du -sm /var/log sometime. [16:27] <Raynerd> It is headless and in position! I'll send you a link shortly so you can see what it is doing! [16:27] <Raynerd> Yes it is. [16:31] <gordonDrogon> syslog makes it relatively easy if you can work with it - there is a daily log rotation, old logs are compressed and eventually deleted automatically. [16:35] <ShorTie> no fair, you know all tricks, lol. [16:37] <gordonDrogon> ok.... looks good, but ... units? [16:38] <gordonDrogon> where is that pointing to? [16:39] <gordonDrogon> just wondering what the monument is. [16:41] <Raynerd> Right yo, heading out for a bit. Thanks for help! [16:49] <MProg> is that temperature reading correct ? [16:50] <gordonDrogon> it's 10C outdoors where I am (in england) right now. [19:35] <pa> is it possible to make the pi spawn a program upon gpio two pin shortage? [19:43] <pa> how do i do that? any page explaining it? [19:44] <pa> i mean, technically, could i just set it up and test it out on the fly, like with a screwdriver or something? [19:46] <gordonDrogon> more or less. [19:46] <gordonDrogon> you'll need some additional software to make life easy though. [19:47] <gordonDrogon> and the ability to write a shell script. [19:48] <gordonDrogon> if you get & install wiringPi: http://wiringpi.com/download/ then you can use its gpio command in a script - just get the gpio command to wait for a pin going low (for example) then the script halts, and caries on when the pin goes low. [19:53] <dagle> shiftplusone, Datalink When I try to use it now without the case (and a newly flashed working img) I get card start.elf not found. The start.elf is there and it have worked before and I'm gently pushing the card downwards. [19:53] <dagle> fsck return nothing on the partion. [19:58] <pa> ah i understand, thanks! [20:29] <gordonDrogon> pa if you use the I2C pins then they have pull-ups to 3.3v already on the Pi's motherboard. All you need to to is short them to 0v. The gpio command to wait on them would them be: gpio wfi 8 falling (use 8 or 9 as that's their wiringPi pin numbers) if you have that in a script, then the script will stall until the pin is shorted to the 0v line. [20:35] <rikkib> I also use a current limit resistor of 560 ohms in series with the switch. [20:36] <pa> gordonDrogon, shorting them to 0 means shorting them with gnd? [21:17] <raynerd> shiftplusone: you about? [21:18] <raynerd> what does it suggest if my Pi has a network connection but is not getting the correct clock time! Proxy settings are in I can access websites - not correct time though! [21:20] <pyb0k3h> im an electronics noob, i see that pin 1 outputs 3.3V, but at what current is that at? [21:21] <rikkib> How do all the windlows maachines get the time? [21:22] <raynerd> rikkib - thank you. It is driving me insane. I have a great script running perfectly here from home but when I take it into the kids to use at school - nothing on the school network! [21:23] <raynerd> it has to be blocking some functions of my script as well. [21:24] <pyb0k3h> hey guys, how much amps is being used to output 3.3 volts in pin #1? [21:25] <pyb0k3h> is there a wiki or site that has the specs on the GPIOs? [21:26] <raynerd> rikkib - do you write python? [21:26] <pyb0k3h> so by default, it is .008 amps? [21:27] <pyb0k3h> so which is it? 0.008 amps or 0.004 amps? [21:29] <pyb0k3h> which wiki has the spec info? [21:30] <raynerd> rikkib - I would still appreciate your thoughts. I am running a script called airpi and it outputs data read by the GPIO to a website called xively. The script runs until it pauses and fails on the "upload" - i.e I can`t upload the data from work!!! [21:31] <dagle> Would it be a bad idea to put in a piece of paper betwen the cardholder and the card (on the top) so it pushes the card downwards? [21:31] <raynerd> using pure obvious logic, the website shown there https://api.xively.com/v2/feeds/ is the one that needs to be open in the firewall right? [21:33] <raynerd> I dont know what you mean? [21:35] <raynerd> hi mate. I`m in work tomorrow! Just wanted to ask your advice regarding the IP of the site that needs opening. [21:35] <raynerd> shiftplusone - spent more hours on the project now and it even takes a picture and uploads to twitter! [21:35] <raynerd> I just know when I take it in tomorrow, it won`t work again. [21:37] <shiftplusone> pyb0k3h, "hey guys, how much amps is being used to output 3.3 volts in pin #1?" that doesn't make sense. The current depends on the load. [21:38] <shiftplusone> PING api.xively.com (216.52.233.120) 56(84) bytes of data. [21:40] <raynerd> rikkib - I am on such a machine now! [21:40] <shiftplusone> when doesn't it? [21:42] <raynerd> rikkib - in that case how would you support a teacher trying to upload data for a project weather station? [21:44] <shiftplusone> doesn't mean you can't access the IP in question. [21:45] <raynerd> rikkib - sorry but that is just too hard work ... to be honest, if they will open that IP for me I`ll let them do that. If they won`t then I`ll have to question how they can support me. [21:46] <shiftplusone> raynerd, why do you think they would've blocked the IP in the first place? They wouldn't. [21:47] <raynerd> I don`t understand this to be honest. So you are saying that if you were IT this request is just not possible ? [21:47] <raynerd> just seems insane. [21:49] <raynerd> shiftplusone - no comment. [21:49] <raynerd> one of them said, "find the ip and we`ll open it" !! [21:49] <shiftplusone> you'll need to figure out what's going on yourself and then tell them. [21:50] <raynerd> THE big big issue now like you said, is the fact that we can access https://api.xively.com/v2/feeds/ from a browser in school so it can`t be blocked! [21:52] <rikkib> Are using curl... If not check it out. [21:52] <raynerd> The code runs fine but halts for ages at the "upload" stage and then after way way longer than usual, fails. [21:52] <shiftplusone> raynerd, I don't mean to annoy you, but have you played around with python requests from home yet? [21:53] <raynerd> no - I`m not sure what you mean. [21:53] <raynerd> it what way do I need to consider them? [21:54] <shiftplusone> well, no... #include is c, python uses import, but that wasn't the main point there. [21:54] <shiftplusone> Do you know the basics of how http works? [21:56] <shiftplusone> In a nutshell, when you open a URL in the browser, it sends a GET request to the server containing the page you want and the host. The server replies with a response header, containing information about the information that comes afterwards, which is the page itself. [21:57] <shiftplusone> There are also POST and PUT requests which work in a similar way. [21:57] <shiftplusone> Your application sends out a PUT request in order to send the data. [21:58] <shiftplusone> If you can open up python import the requests library and then try a simple get request, it will be an important data point in figuring out what's wrong. [21:58] <shiftplusone> GET must work, since that's what your browser does. [22:00] <shiftplusone> In any case, you will be able to examine the returned request headers and whether you get any at all. [22:01] <shiftplusone> Well, it's strange. The way the code is written is that it should give you a meaningful error if the put request fails. [22:01] <shiftplusone> You are saying that all you get is "upload failed"
[22:01] <shiftplusone> which is not a string I saw that could come from the code. [22:02] <shiftplusone> does it say "Failed to upload" ? [22:03] <instigator> Hi all. Is there a SFTP client for raspberry pi which uses passphrase protected public keys? [22:03] <shiftplusone> instigator, must it have a fancy gui? [22:05] <shiftplusone> you can use rsync or scp, for example. [22:06] <raynerd> would there be a way to "see" or record more of an output while the code is just hanging - I presume it must be doing something. The one thing IT did say is that during the halting, while observing the firewall and ip of my Pi, there was no feed from it, no ouput or input to the raspi! [22:10] <raynerd> ShorTi - it can not be my pi as the minute I bring it home IT runs just fine!!! [22:10] <raynerd> It is sat here now working away! [22:10] <shiftplusone> raynerd, ultimately, if you can get requests working in python, you'll have to use pdb to figure out exactly where it's failing. I don't generally write python and have no interest in it, so I can't figure it out from the code alone. [22:11] <raynerd> ShorTie - it has to be due to the school network though. [22:11] <shiftplusone> But you have a line sending the put request, then is no response, it outputs "Xively Error: " and then the error and then it would say failed to upload. In your case, it doesn't putput that 'xively error' part. [22:12] <shiftplusone> so maybe it's timing out. [22:13] <ShorTie> didn't you say you could not even ping the firewall ?? [22:13] <shiftplusone> raynerd, from what I remember, apt uses a different mechanism. [22:14] <raynerd> Exactly, it would be good to just check I can connect to the internet in terminal!! [22:14] <Nefarious_> gordonDrogon: sorry, i overreacted. [22:14] <raynerd> Hey Nafarious_ ! The code is working great mate! [22:14] <raynerd> Yes mate.... you should see the code now! [22:15] <ShorTie> or any other pc on the network ?? [22:15] <raynerd> It tweets and takes a picture and have a fresh config page to choose to use camera mode ! [22:15] <shiftplusone> raynerd, you can try a browser like elinks. [22:17] <Nefarious_> shiftplusone: may i try something? [22:17] <shiftplusone> Nefarious_, if it's nothing evil, sure.